Moss Building & Design Announces New Workshop, "Design It"
MOSS announces the latest installment in their HandyMOM101 workshops, Design It. Nothing beats a hands-on workshop where you can learn a new skill and ask questions along the way. Moss Building & Design, an award winning remodeling and home improvement company in Chantilly, VA, defines themselves as a remodeling expert and a helpful resource for their customers in Northern VA.
One aspect of MOSS that distinguishes both of these characteristics is through their HandyMOM 101 workshops. Moss Building & Design offers a series of workshops for moms’ groups in Northern Virginia who are ready to tackle home maintenance jobs (honey-do lists) but need someone to show them how. With the HandyMOM 101℠ program, MOSS hopes to cover some of the smaller items on homeowners’ “honey-do” lists by empowering women to tackle those items themselves. Each HandyMOM 101℠ workshop will include a presentation by a MOSS pro, followed by a hands-on station where attendees will get to try their skills under MOSS’ watchful eye. The HandyMOM 101 workshops tackle activities such as drilling, tiling, electrical work, and more. Due to the popularity of the programs, Moss Building & Design has created a brand new workshop, "Design It," where their resident kitchen/design experts will discuss current kitchen and bath design trends for 2017. 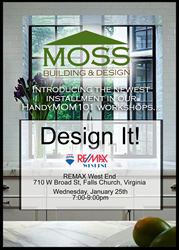 MOSS has hosted several of their Handymom101 workshops at the RE/MAX West End, and will debut their Design workshop here as well. The debuting of the workshop will take place Wednesday, January 25, 2017 from 7:00-9:00 PM, with Zaiba Hasan of MOSS' Community Relations Team as well as the home improvement professionals at MOSS. The program will continue to develop over time and take place at several different locations. Admission is free, but an RSVP is required. Those who want to attend can sign up here. MOSS is offering a $250 gift certificate to those who would like to host an event. If the event has at least 10 attendees, the host will be upgraded to a free Handyman for a Day for hosting! Make a fun night of it and invite your closest friends. E-mail us for more info! Moss Building & Design and Moss Home Services is an award-winning residential remodeling and home services company located in Chantilly, Virginia. As a trusted home improvement company in Northern Virginia, MOSS focuses on providing customer service that is unparalleled by any other contractors in the area. Through trust, transparency and character, MOSS builds lifelong relationships with their customers. Since 2001, MOSS has established a reputation for excellence in remodeling additions, kitchens, bathrooms, basements and home services throughout Northern Virginia. Their customers see them as a trusted partner, and MOSS is very proud that over 85% of their customers consider themselves ‘customers for life.’ Moss Building & Design has won consumer awards from Angie’s List for seven consecutive years and also has an A+ rating from the Better Business Bureau as well as many industry building and design awards.